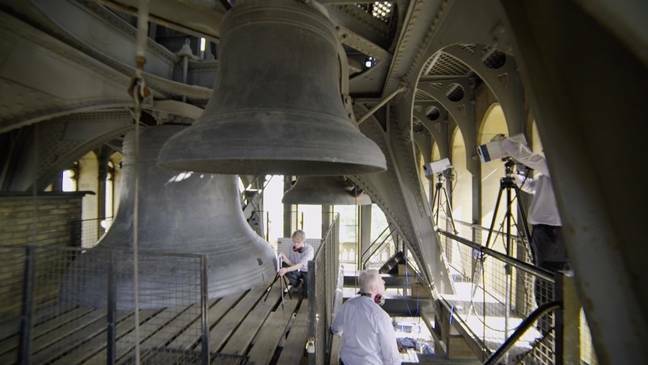 Vibrations emitted by Britain’s most famous bell have been mapped for the first time by engineers from the University of Leicester. As everyone must know by now, Big Ben is housed at the top of Elizabeth Tower, London, and chimes faithfully every hour over the capital. Its deep bong can be heard whenever a giant 200kg hammer bangs onto the side of the thirteen-ton metal bell, which was cast in 1858. The racket is instantly recognisable, earning it a Twitter account that inexplicably has nearly half a million followers. All it does it tweet "BONG" on the hour. Half. A million. Followers. ...or something far more sinister? A crack team of laser-wielding researchers stepped forward to investigate and basically discovered nothing of worth, to be honest. Well, fine, it's probably useful to mechanical engineers who want to know how metal things change shape when hit. Material scientists might want to take a peek, too, we guess. Crucially, it's fabulous material for BBC producers who love science that people can vaguely relate to even though they have no idea, no clue at all, what to do with the information. Anyway, if you're still here, thanks for the ad and page view. Happy Friday to you. You'll probably not be surprised to learn that Big Ben's ominous sound is the combination of several frequencies. The team of researchers analysed four of Big Ben's chimes at 9am, 10am, 11am and 12pm using a technique known as “laser Doppler vibrometry” to, well, if you've got the kit, you may as well point it at something. Especially if it involves getting in a car and driving out of Leicester at 70MPH. By using Laser Doppler Vibrometers (LDV), the uni eggheads measured the vibrations of Big Ben without touching it: laser beams from the LDVs were directed onto the bell’s surface. By measuring the Doppler shift in the reflected beam's frequency, as the bell trembles after being thumped by the hammer, the amplitude and frequency of the bell's vibrations can be determined. The vibrations were then mapped onto a 3D computer model of Big Ben. "Many of the vibrations in the metal of Big Ben are too tiny to be seen by the naked eye," said Martin Cockrill, a technical specialist from the department of engineering at Leicester uni. "But this is what we were able to map using the lasers and not just one or two points on the surface; we were able to get over 500 measurements across the surface which just wouldn't have been possible with previous technologies." The sound comes from a mixture of frequencies and vibrational patterns that are a result of the physical properties of the bell itself. Since Big Ben is thicker than other bells of similar size, it weighs more, and has a higher pitch than expected for its diameter. The main frequencies found on the popular landmark were 199Hz and 336Hz, equivalent to a note G in the third octave and E in the fourth octave. “Aside from the technical aspects one of the most challenging parts of the job was carrying all of our equipment up the 334 steps of the spiral staircase to the belfry,” Cockrill said. "Then to get everything set up before the first chime, we were literally working against the clock."